FGC BOLSA - FGC FINANCIAL MARKETS INFO: What's News | Julian Assange Arrested; Bezos' Space Tourism Ambitions; Who Creates Kids' YouTube Channels? What's News | Julian Assange Arrested; Bezos' Space Tourism Ambitions; Who Creates Kids' YouTube Channels? Julian Assange arrested in London. 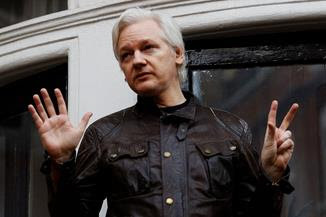 British police arrested the WikiLeaks founder at the Ecuadorean embassy this morning, after that country withdrew asylum protection. In a statement, police authorities said they were holding Mr. Assange at a police station. Sudan's leader under pressure. President Omar al-Bashir's 30-year-old regime hangs in the balance as reports grow that the leader has been forced from power following months of mass protests. Mr. Bashir's ouster is set to herald a major reconfiguration of power in the country and adds volatility to a large swath of North Africa. Request for Trump's tax return is stalled. Treasury Secretary Steven Mnuchin said the request raises “serious issues” about whether the committee has a legitimate legislative purpose and how broad congressional investigatory powers are under the Constitution. William Barr to probe "spying on Trump aides." The attorney general said he would form a team to examine the origins of a 2016 investigation that conducted what he termed “spying” on people affiliated with the Trump campaign. Uber pursues lower valuation. The ride-hailing giant will aim for a valuation in its impending initial public offering of as much as $100 billion, below previous expectations, as competitor Lyft stumbles in early days of trading as a public company. EU leaders agree to delay Brexit until Oct. 31. The decision was a typical EU compromise, this time between member governments that favored a short extension and those that wanted a much longer one. The further postponement does little for businesses looking for clarity over the direction of Brexit. A quiet $200 million land grab. 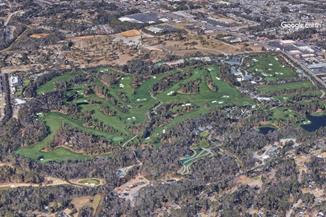 The home of the Masters tournament, which begins today, has spent around $200 million to buy more than 100 pieces of land totaling no fewer than 270 acres, according to a Journal analysis. Can Jeff Bezos make money in space? Ten years ago, Blue Origin consisted of Jeff Bezos and a few researchers. 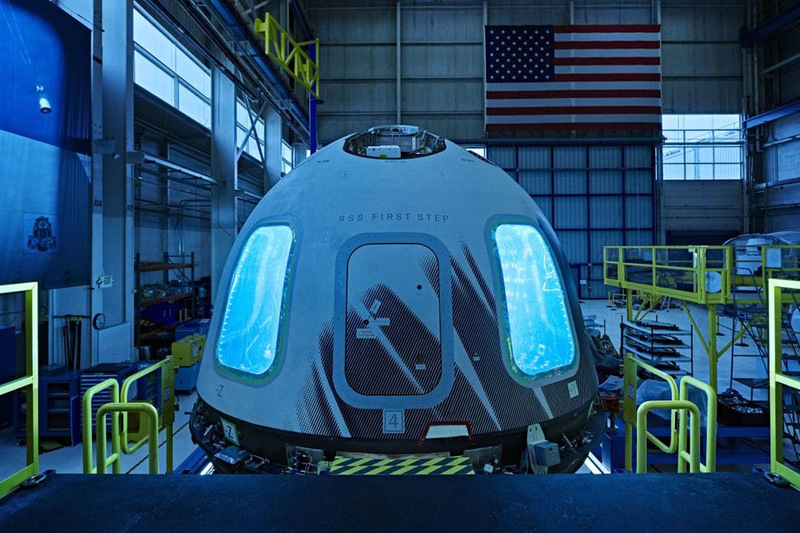 Today the company employs more than 2,000 people at five sites, including a launch facility in West Texas where later this year it will begin manned tests of its suborbital space tourism rocket. Hush-money probe gathered evidence from Trump's inner circle. Federal investigators in New York, looking into payments to Stormy Daniels and Karen McDougal, questioned longtime aides of the president early in the probe and amassed more evidence than previously known. Brazil to charge Vale over dam collapse. Prosecutors plan to file criminal charges against the mining giant and its employees for the deadly collapse of a mine-waste dam in January. Over the next few months, prosecutors expect to determine if senior Vale officials knew the dam was at risk of collapse. Kids love these mysterious YouTube channels. CoCoMelon is the top children’s video channel on YouTube, with 43 million subscribers and 1.96 billion views in October, but the content creators behind the juggernaut are elusive. Six tax changes retirees should know. The 2017 tax overhaul created new opportunities to cut taxes, along with some potential headaches. Here are six important changes that retirees should be aware of and the steps to take to reduce future tax bills. Disney's next big remake: itself. This fall, Disney launches its new streaming service, setting up a major battle with Netflix. Can it transform into a nimble tech company? 1. What tax cut? Almost half of American households are getting a tax cut of at least $500 in 2019—but most Americans say they haven’t noticed a benefit, or say their taxes have actually risen. 2. Don't blow off the taxman. There’s a lesson in the tale of a Texas man who now owes the Internal Revenue Service $26 million: File your tax return, writes Journal tax columnist Laura Saunders. 3. Embrace Plan C. Startups are adopting a corporate structure that previously made sense mostly for big publicly-traded companies: the C corporation. First image of a black hole is revealed. Scientists revealed the first-ever image of a black hole in what experts called a monumental discovery that confirms some of Albert Einstein’s long-standing theories about general relativity. Boeing and its 737 MAX jets have a China problem. One of China’s state-owned airlines joined the list of carriers seeking compensation from Boeing over the grounding of its 737 MAX fleet in the wake of two deadly crashes. The small move highlights a bigger challenge for the airplane maker: ensuring China, one of its largest customers, keeps faith with the jet. 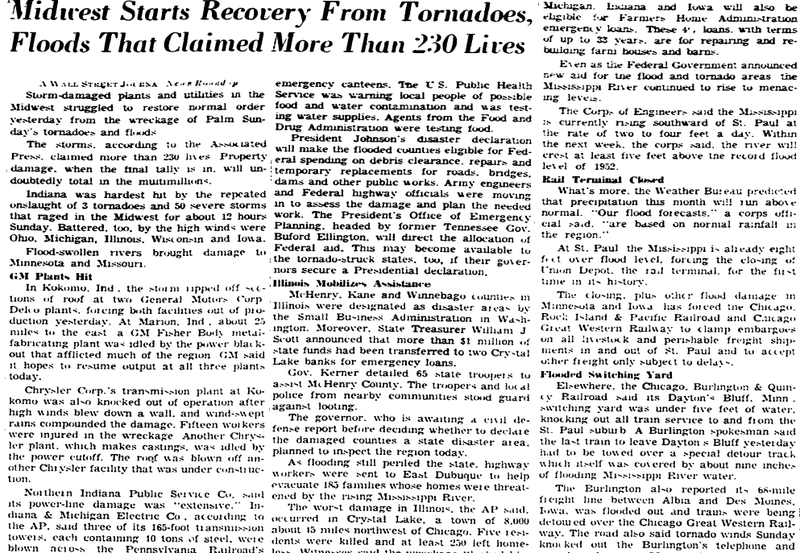 A series of tornadoes devastated the midwest of the U.S., killing 271 people and injuring 1,500. The tornadoes occurred in a swath 450 miles long and lasted 12 hours.